Lately I’ve been noticing an increase in the conversation around the need for middle grade novels that deal with “difficult” topics. Just a few weeks ago I saw on Twitter this terrific new campaign called #MGGetsReal where 5 middle grade authors are collaborating to promote books that in their words “help readers navigate life’s struggles”. They are giving away copies of their own books to get them in the hands of more kids, but also shining a light on other authors’ works as well. Books with weightier themes tend to be “bubbling up” in conversations lately so I thought it would be a good time to examine that a little more closely. First, we’ll list some of those “tough” topics with some examples. Then, I’ll discuss why it’s important for kids to have access to those books, some thoughts about how to book talk novels with more intense themes, and then I’ll share some resources if you want to dig deeper and jump into the conversation yourself. What are those “tough topics” for middle grade readers? There are so many more topics and fabulous novels that handle those issues well – I could go on and on. Later on I’ll share a resource where you can get an extensive list of books by topic. And in looking at those themes – each one is a strongly emotional subject and some are even charged with a bit of controversy. I think adults tend to tread carefully with such emotionally charged topics, and sometimes you just don’t want to say the wrong thing. In that way, they’re “tough” – because they are difficult for US to talk about. Why do children need books with “mature” topics? Well, mainly, because kids ARE dealing with these issues. Think about the students in your class, the kids you see in your library, or the children in your neighborhood. I am sure you know of many, many children who are dealing with some tricky situations. And that’s the stuff we KNOW about – imagine all the things that are just too painful or complicated for them to even bring up. These books help kids realize they’re not on their own. These novels let kids see a path through adversity through the actions of a character. And maybe the ending is not perfect, but there IS a way to get through it. Also – novels that bring to light issues such as depression or gender identity in way that’s appropriate and understandable to a middle grade reader is incredibly important for building empathy and helping students recognize the humanity in others. And too, at a time when our society is going through huge cultural shifts, children need stories to help them navigate that. Kate Messner, the author of The Seventh Wish (and lots of other amazing books) had a great quote in a recent interview about this topic. I’ll link to that full interview in the show notes, but here is a snippet of what she said, “Stories will help you understand yourself and help you to imagine what it might be like to be somebody else. That’s empathy, and if you build that muscle, we’re going to end up with a better, braver, kinder world because of it.” Yes! I’ve been thinking a lot lately about how I’ve presented some of these books in the past and been reflecting on the language I want to use to describe them going forward. I want to make sure that I’m not inadvertently embedding a sense of shame to a topic like homelessness or depression by my tone. I also want to make sure that the words I use recognize that these issues DO impact the people in our community, our school, and our classroom. It’s not some far off issue for others to deal with. For example, instead of describing Katherine Applegate’s Crenshaw as “a book about a homeless boy whose family suffers through tough times” I might say something like “Crenshaw is great story about a kid named Jackson. Like many families, Jackson’s folks are coping with lack of money and sometimes not having a permanent house to stay in. It’s about imagination and resilience, and has tons of really funny parts.” So, I think I’m going to try using a more positive tone that focuses on hope and the journey of the character. I just want to add also that kids generally know when they’re not ready to tackle a topic, and they’ll put it down. If you want to know more about the #MGGetsReal campaign, a great place to start is their main website: www.mggetsreal.blogspot.com which will get you to giveaways, a great video previewing the author’s five books, and it will take you to that list of 166 middle grade titles that tackle tough topics. They’re also looking to update it with reader suggestions so definitely share books you think should be included. I’ll also put a direct link to that in the show notes so you don’t have to hunt around. And if you want to join the conversation online, jump in with the #MGGetsReal hashtag! I’d also love to hear your ideas about how you present book talks for novels that include difficult subjects. Email me at booksbetween@gmail.com or connect on Twitter or Instagram at the handle @Books_Between. In this part of the show, I share with you three books centered around a theme and discuss three things to love about each book. This week, as we approach the 15th anniversary of 9/11, I’ll be talking about three September 11th themed novels: Eleven by Tom Rogers, Nine, Ten: A September 11 Story by Nora Raleigh Baskin, and Towers Falling by Jewell Parker Rhodes. On September 11th, 2001 – I was 24 years old, a newlywed, taking night classes to get my masters in elementary education, and I had Tuesdays off of work. So I was home catching up on sleep when my husband called me from work. And I so vividly remember him telling me, “Turn on the TV” And, being a bit groggy, I asked, “what channel?” and when he answered, “ANY channel!” – I knew then that this would be one of the days you’d remember forever. It was a long time before I felt ready to read a novel based on 9/11 – for years it seemed too fresh for me. It’s almost the same reason why constructing new buildings on ground zero seemed so wrong – I didn’t want anything else, any fiction to override the real story from that day. But – after 15 years, the time does feel right finally. And now there’s a whole new generation of kids that were born well after 2001 – and they need these stories. I’ve been so happy to see how many parents and teachers are picking up these books and planning 9/11 book clubs and sharing their own stories of that day. The Stray Dog. On his way to school, Alex spots this mangy looking mutt out the bus window, and their eyes lock and there’s an immediate connection between the two. So when he’s dismissed early from school, the dog happens to still be around and Alex decided to gift himself this mess of a dog for his own birthday. Throughout this unsupervised day, Alex and his sister and this dog have all kinds of adventures – good and bad. And eventually Alex has to comes to terms with that ethical decision of keeping this dog or not. The Man in the White Shirt – The chapters in this novel alternate between what’s going on with Alex and later Mac and the experiences of this unnamed survivor of the 9/11 attacks who is trying to his make his way home. And each of the chapters has a timestamp under the chapter title so we often know what’s going to happen before the characters do. It’s powerful, and I kept trying to find clues to figure out who this guy WAS. Is it Alex’s dad? Maybe Mac’s son or the owner of the stray dog? And as we kept returning to the story of the Man in the White Shirt, I kept thinking – how are these pieces all going to fit together? How is this going to resolve and get wrapped up? But – part of what I ended up liking so much about this book was that the pieces don’t all neatly come together at the end. And I think that is an honest representation of that day – the picture just wasn’t going to be complete anymore. Tom Roger’s Eleven is a fantastic story that has an almost quest-like feel to it with a touch of Hoot and a little bit of Rain Reign. And the destruction of the towers is told in sensitive way that’s really appropriate for middle grade readers. 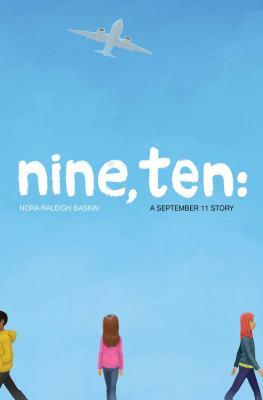 Our second 9/11 themed novel is Nine, Ten: A September 11 Story by Nora Raleigh Baskin. This book takes a different approach to coming at the topic of 9/11. It’s the story of four kids in the days leading up to September 11th and most of the narrative takes place between September 9th and just as the attacks begin on the morning of 9/11. Our four main characters are: Will, who lives in Shanksville, Pennsylvania and is grieving the sudden death of his father last year. Aimee, who recently moved to LA after her mom got a new job at Cantor Fitzgerald. Her mom has a meeting in NYC on 9/11. Sergio, who lives in Brooklyn and is a star math student but struggles with family situations. He has a powerful and probably life-changing encounter with a fireman on a subway the day before 9/11. And finally, we are introduced to Naheed. She’s a Muslim 6th grader who lives in Columbus, Ohio and she sometimes feels a bit uncomfortable when people ask about her name, her beliefs, or her headscarf. The connection of the kids at the beginning of the novel and then at the end. So, the first part of this book takes place on September 9th at O’Hare airport in Chicago where all four characters bump into each other in some way or another. Naheed is there to greet her aunt and uncle, Sergio is traveling back from getting a big math award, Aimee is coming back from her cousin’s bat mitzvah, and Will has a layover in Chicago after a trip to Disney with his family. There’s very little conversation between the characters and they all go their separate ways, but I love how at the end of the novel, their storylines weave back together in New York City on the one year anniversary. The story of Naheed’s first hijab. It’s just a few paragraphs but she talks about how connected and special she felt when first learning to wear it when she was in 4th grade. Her mom helps her practice how to wrap and pin the blue fabric, and I really appreciated this window into a cultural practice that can sometimes be misunderstood. How several of the characters discovered new meaning in their life through helping others. As I mentioned before, Will and his family are in deep grief after losing their father in an awful truck accident. But after the plane crashes in that nearby field in Shanksville, Will and his mom start to come out of the darkest part of that when they really get involved in the local efforts after the attack that help the families of Flight 93. Another of those instances was when Sergio is skipping school and finds himself helping this firefighter save a man’s life as they are all stuck on a subway. That event and what happens afterward has an incredible impact on Sergio and really speaks to the power of doing for others. I just loved Nine, Ten: A September 11th Story and I really think my students this year will connect with Aimee, and Sergio, and Will, and Naheed. I can’t wait to share this book with them. 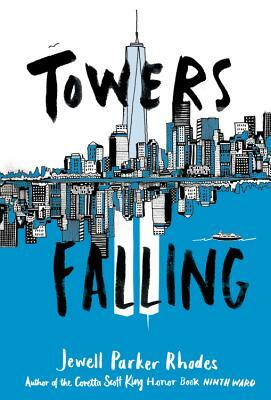 The third 9/11 themed novel I’m talking about this week is Towers Falling by Jewell Parker Rhodes. Nine, Ten takes place before September 11th and the main events of Eleven happen on the day of, but Towers Falling is set in the fall of 2016 – around the 15th anniversary of the attacks. The story is told from the point of view of 5th grader, Dèja. She and her family are living in a homeless shelter in Brooklyn, and she’s attending a new school where her teachers are all doing 9/11 themed projects. The assignments frustrate her because she has very little knowledge of the Twin Towers or anything else about the attacks. At one point, she finally asks her teacher, “I wasn’t even born. Why should I care?” and that is essentially the question the novel attempts to answer. The honest depiction of the stressors of poverty that Dèja’s family is facing. It’s not just the lack of money and things – it’s the added other stuff like having to shower with strangers and the danger in that, not knowing things because you don’t have access to a computer or books, the tension from living so closely together without a private spot to let off steam or have a cry, and how Dèja is in charge of her younger siblings wherever she goes – and that’s tough on her. The bravery of Deja’s friend, Ben. He’s a new kid, too, going through his own troubles and a little awkward with his cowboy boots but, boy – he has Dèja’s back. And when Dèja decides to skip school and take a subway to see the 9/11 Memorial for herself, he goes with her and risks the wrath of his family – bringing her extra gloves and buying her lunch. I really love how he and the other characters gently take care of Dèja while still being aware of her pride. When they’re running away to New York, he also references Claudia of From the Mixed Up Files of Mrs. Basil E. Frankweiler – so he won me over right there. The drawings in the book. There aren’t a lot of them, but maybe that makes those few all the more powerful. There’s one that illustrates the interconnected circles of social units that Dèja is learning about in school and then a drawing of linked paper dolls she made. I think my favorite are the sketches that Ben did of the 9/11 memorial and his drawing of the people on the subway. Towers Falling is the perfect book to put in the hands of a child who is interested in learning more about what happened on September 11th, but who might not want something too intense. Your middle grade readers – and you! 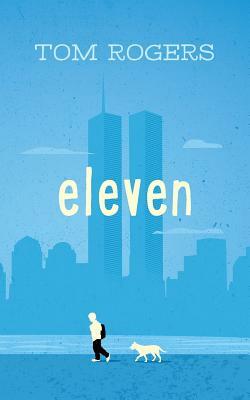 – will really like Eleven, Towers Falling, and Nine, Ten: A September 11 Story. A question that has come up a lot for me lately as I’ve been connecting with other teachers who are setting up their classrooms is: should we level our classroom library? I’ll say that my thinking on this topic has changed over time – and it may change again. But, all of the recent research done on leveling classroom libraries seems to suggest – no. We should not. Now – that isn’t to say that we shouldn’t know the levels of the books in our room in order to make really good recommendations for our students. I think that is extremely helpful and necessary. In fact, this summer – I brought home (much to my husband’s delight), my entire classroom library, including the bookshelves, so I could sort and weed out and yes, add the Fountas & Pinnell letter discretely inside the book. However, I also don’t think that kids should just be let loose to grab books without some discussion on how to pick books that are a good fit for them. But that “good fit” could mean many things – not just the letter of the book. That really captures the heart of my thinking on it right now. I want to create a community of readers that are (eventually) good at discerning what texts work for them – not a classroom where books are dispensed based on a level that then becomes very public. There’s a whole lot more to say about this, and I think it’s worth revisiting in a future episode. But in the meantime, please – send me an email or message me – how are you feeling about classroom libraries that are organized by level? Okay – that wraps up our Q&A section this week. If you have a question about how to connect middle grade readers to books they’ll love or an idea about a topic we should cover on a future episode, please email me at booksbetween@gmail.com or message me on Twitter/Instagram at the handle @Books_Between. Thank you so much for joining me this week. You can get a full transcript of this show, and all the other episodes, at our website – BooksBetween.com with links to every book and article I mentioned today. And, if you like the show, I’d love it if you subscribed on iTunes or Stitcher and left a rating so others can find us as well.